So, I realize I am Josie Natori’s daughter-in-law, and so to say I love Natori products should not come as a shock. That said, as opinionated and open as I am, sometimes I don’t love all the designs and products each season that Natori offers. But right now, I am **so** obsessed with everything in Josie that I could literally buy everything. EVERYTHING. And I swear to god, I am not just saying that because I have to. I don’t have to. And I do love everything. Pinky swear. So much that I can’t even write one post about everything I love, because it would be pages and pages long. Josie has evolved a lot in the past several seasons. I have always loved the idea of Josie — being young, fashionable, comfortable, and hip — but have never loved all the clothes. Yet right now, O.M.G. I love everything!!!!!!!!!!!!!!!! Today, I am just going to focus on my love for the Kabuki pajama and tunic. The funny thing is that until recently, I actually didn’t wear pajamas. I was the girl that wore a t-shirt to bed. I know, ridiculous because I guess I do know some people in the sleepwear industry. But up until now, I just wanted to sleep in a t-shirt. That is, until I discovered the current Fall/Winter 2011 Josie collection. And now, I am never going back to my old ways. I am now a pajama girl. I know it sounds super cheesy, but they (all the Josie sleepwear items) really are unbelievable. So, the Kabuki PJ set…. It is the most comfortable and glamorous pair of pajamas in this world. 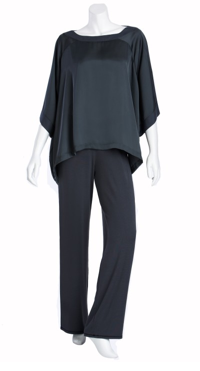 The boxy top has the nicest and most flattering shape, the material is soft, easy, and light. I honestly feel that I can entertain (not joking) or go out to the corner deli in them. And the price is reasonable for the set, too. $84 gets you one good looking set of pajamas. Hurry up and buy for your best friend, your mom, your sister, and yourself. I promise you that you will love it as much as I do and that you will say goodbye to your current pajamas (or t-shirt) and warmly embrace this new item. LOVE it. Until Friday. Have a great week. What does Japanese dance drama have to do with PJs. The Asian schtik is an acquired taste and definitely not for everyone. These pajamas rock! I live in them… I don’t only sleep in them but wear them to the mall, movies, just about everywhere. I’m loving the Josie Maiko Butterfly Tunic too! Anonymous- why are you a hater? you are reading a blog associated with Natori. No one is forcing you to do it. there is plenty of other stuff on the internet you can read if you aren’t into “the Asian shtick”. Please share what else you like about Josie. I agree, the brand is looking great. I was thinking your cartoon banner along the top doesn’t seem to do match the Josie image you just posted (the beauty sleep).. Just a suggestion to maybe update with something more fresh. Thanks! I don’t want to reveal too much (I need to save material for future posts! ), but I love the print screen dresses/tunics, which you can find here. The one I own is the Maiko Feather Tunic. Also, thanks for your comment about the cartoon. We wanted the top banner to be more generic (we didn’t want to confuse people by having a picture of a model since they might think the model was “the josie girl”). Hope that makes sense and thanks for the comments! Love it! Adding it to my xmas list.